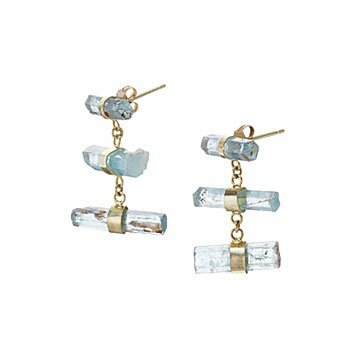 Amy Shepsman's earrings showcase the stunning natural beauty of aquamarine crystals. Reflecting the translucent palette of the ocean, Amy Shepsman's aquamarine earrings showcase the stunning natural beauty of their blue-green crystals. Amy sources all of the hexagonal crystals for their size, shape, and clarity, then captures them in a dangling chandelier of green-gold vermeil bezels that subtly complement the sublime color of the stones. They'll immediately become the focus of any ensemble, catching the light with shimmering motion. Gold-plated sterling silver posts. Handmade in New York.